Read below to find out more about the required and recommended upload specifications for your PDF file on Paperturn. Maximum file size is 512MB. You can have an unlimited number of pages, as long as the file is 512MB or less. TEXT SIZE: Documents designed for web use should generally have larger text than for print, with the gold standard being viewing your design on an actual device; however, we recommend an absolute minimum font size of 12px (visible only when using the zoom function), with optimal size being 22px for easy reading without using the zoom function. FORMAT: The dimensions of your flipbook is a matter of personal preference; however, the optimal dimensions for best viewing experience on monitors with standard standard aspect ratios of 16:9 and 16:10 is 1300x1200 (per page). In layman’s terms, a horizontal format page which is longer than it is tall. IMAGES: Export the images that you use in your PDF file as images for web. Remember to include “www.” when writing the link. Typos cause broken links or may direct users to the wrong website. 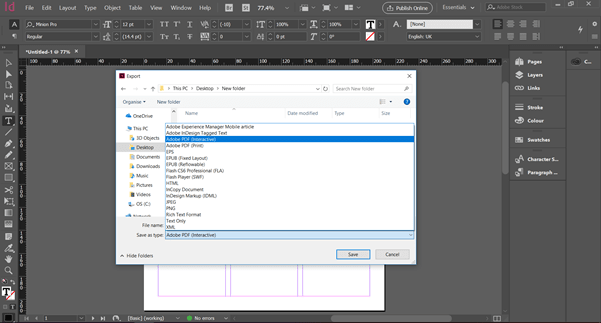 The Adobe PDF (Interactive) format is for saving PDF files with the interactivity added in InDesign, like links, buttons, video, and more. 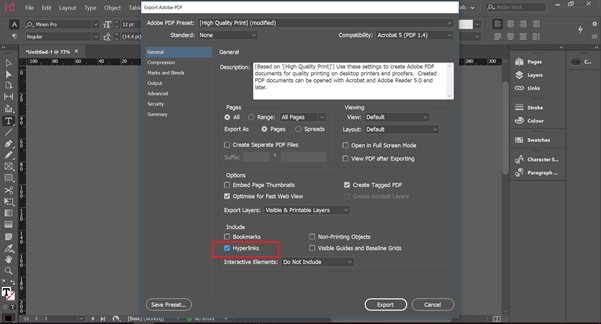 If you are using Adobe InDesign and choose to export the PDF as Adobe PDF (Print). Remember to include Hyperlinks.